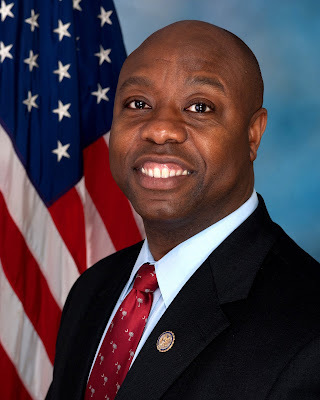 One of my heroes in the United States Senate is Senator Tim Scott, R-SC. In 2013 when Senator Jim DeMint vacated his Senate seat from South Carolina, Governor Nikki Haley appointed Senator Scott to temporarily replace him. In Nov. 2016, Senator Scott made history when he won his first full term to the Senate and became the first African-American elected from the South since reconstruction. What is so shameful is that it didn't take but minutes before the bigots from the left came out against Senator Scott after he dared to vote for Senator Jeff Sessions for Attorney General. Like many other black conservatives, this hatred they face from other blacks [and whites] on the left, for the "crime" of being a conservative Republican, is sadly nothing new. That is one reason I did this post on my blog a couple of years ago: "Tales Salutes These Unsung Great Americans". I don't care where you stand on the political spectrum, every decent American must find that hateful speech sickening.